Are you feeling the winter blues and looking for some ways to brighten up and maybe even warm up this spring? We have come up with a way to get you in the spring mood! Are you a Daisy working on your Between Earth and Sky journey? This butterfly chrysalis is perfect for you and your leaders to do together! You can find this project and others at www.spoonful.com. In September and October of every year, a special group of monarch butterflies perform one of the most amazing feats in the insect world: they migrate 2,500 miles to southern California and Mexico to survive the winter and reproduce. What’s even more amazing is that monarchs who are born in the spring and summer typically live for two to six weeks; yet migrating monarchs must live six to eight months to complete their journey to ensure future generations of monarchs. This is the equivalent of a human living 1,000 years. As children, we are entranced by the life cycle of the monarch: from egg to caterpillar to cocoon (chrysalis) to butterfly. The transformation is, I think we can all agree, truly magical. From the Science issue of Classic Play, here is a craft that tries to capture a little bit of that magical surprise, inspired by the tiny pinatas craft by Not Martha. 1. Blow up the balloon and tie it off. 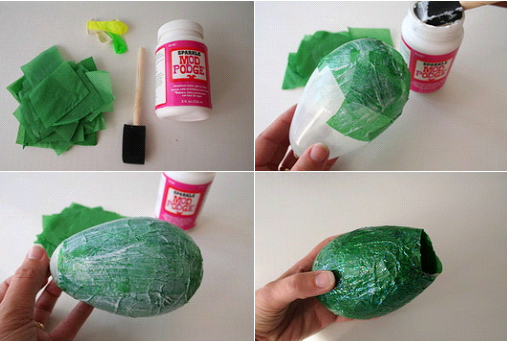 With your sponge brush and Mod Podge, start pasting squares of green tissue paper onto the balloon. When you have finished one layer, set it aside (you can place it on top of a small cup, like an espresso cup) and let it dry completely. You might need to rotate the balloon occasionally to allow it to dry evenly. 2. Continue pasting layers until you have pasted on three full layers, letting each one dry thoroughly before adding the next. After you have covered the balloon in three layers, let the whole thing dry overnight. 3. To remove the balloon from your cocoon, grasp it by the knot, and just underneath, take a pin or needle and make a small hole. The idea is to let the air out slowly and not to just pop it. As the air is letting out, the balloon will pull away from the edges. Once the balloon is removed and depending on what you want to put in the chrysalis, you might need to use some scissors to cut the opening a little wider. 4. I’ll leave it up to you to decide what fun surprises you want to fill the chrysalis with – butterflies, orange and black confetti, stickers – this is the fun part. 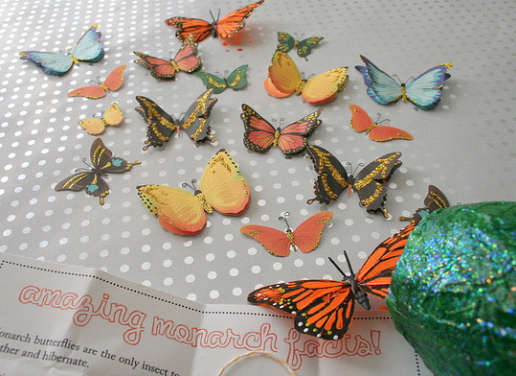 I used a little monarch butterfly that I found in the floral supplies section at the craft store (you could also make butterflies from orange and black felt or from construction paper), and a piece of paper with amazing butterfly facts, which you can download here and print if you like. 5. Once you’ve filled the chrysalis, take a piece of string or twine and tie it in a loop. 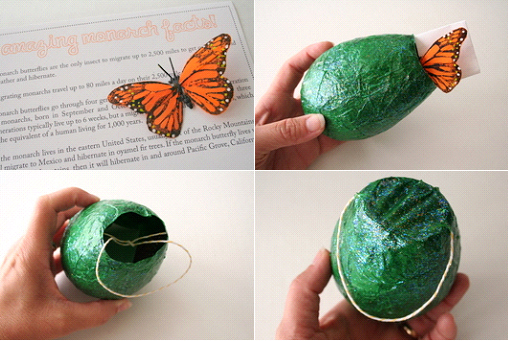 Drop it into the chrysalis halfway, and then paste one square of tissue paper with the Sparkle Mod Podge over the opening to create a string for pulling open the chrysalis. When it is dry, the chrysalis is ready to be opened and the surprises ready to be revealed . . .